For sponsorship questions or more information, contact Emily Jillson at emilyj@edcjcc.org or (202) 777-3231. 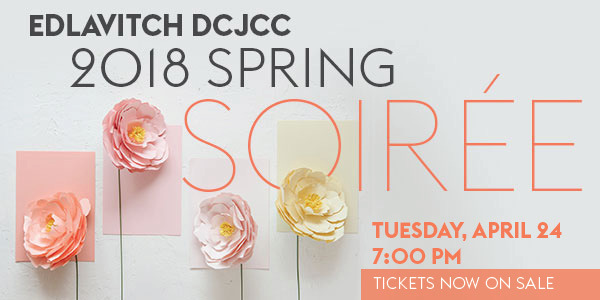 The success of this event, our largest of the year, provides the essential funds to support the meaningful programs and services of the Edlavitch DCJCC. Includes four tickets, reserved seating during Soiree program and reception, full-screen ad, and listing on all materials as Host. Includes four tickets, half-screen ad, and listing on all materials as Benefactor. Includes two tickets, quarter-screen ad, and listing on all materials as Patron. Includes two tickets and listing on all materials as Friend. Two tickets and recognition in digital event program. One ticket and recognition in digital event program. Please send copy, business card, logos, and/or prepared designs to valerieb@edcjcc.org. Full-screen digital ads are 11x5" and 5x11"
Please send copy, business card, logos, and/or prepared designs to valerieb@edcjcc.org. Half-screen digital ads are 5x5"
Please send copy, business card, logos, and/or prepared designs to valerieb@edcjcc.org. Quarter-screen digital ads are 2x5" and 5x2"
I/We are unable to attend, but would like to support the Soiree with a tax-deductible donation.